I really love your recipes, they are simple and easy to follow. I have a question about baking soda and baking powder though... I look them up a bit and know that we usually use baking soda when acidic ingredients is present, if not, the cream of tartar in baking powder will do the job. But in your lovely cookie recipe, baking soda is used, I wonder why not baking powder? Sorry for being a nerd but that question is in my mind for a long time. Yeah, you're right. When baking soda is combined with acidic ingredients (e.g. yogurt, chocolate, buttermilk) bubbles of carbon dioxide will be produced, causing the ingredients to 'rise'. 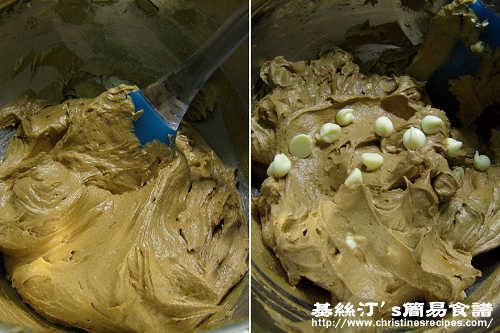 In this cookie recipe, we only need baking soda and pop them in oven immediately, in order to produce best results. You might also find baking soda called for in many cookie recipes. If using baking powder, you might need milk as well. It's usually used for baking cakes and biscuits. For details, take a look at this excellent article. Thanks Christine, now I get some ideas. I bet is the lactic acid in milk that activate the baking soda. I have tried making muffins following your blueberry muffin recipe and the result is very nice. I have tried many other people's recipes in muffin making but none of them makes me happy. Yours is the best! I will try making chocolate cookies following your recipe tonight. can i use plain flour? We call plain flour here in Australia. That's the same kind of flour as the one called all purpose flour in US. do i use the whole egg or just egg yolk? and my cookies seem soft n chewy. is it because of the egg white i used? It's not because of the eggs, but the butter you creamed, the temperature and time of baking. Did you cream the softened butter until it's really really fluffy? When the time of baking your cookies ends, turn off your oven, let cookies stay inside for 5-10 minutes more. They surely become very crunchy. 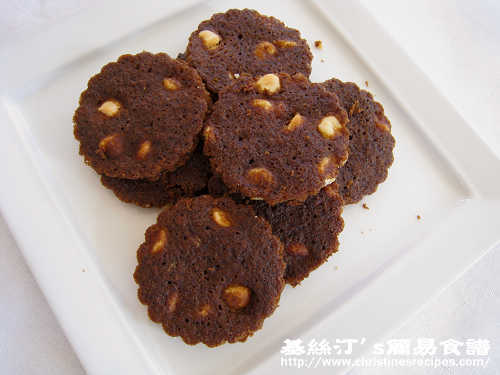 我住在南非, 在這裏只能買到cake flour 和 bread flour, 那我應用那一種?